Time to harvest some fun! Planning a hoedown, square dance or western theme party? Then we've got you covered with the Red Barn Insta-Theme! Make your party a memorable experience for your guests when you decorate with the Red Barn Backdrop and add your own unique touches. Raising the walls of a barn was never this easy! The Red Barn Insta-Theme is great for any country, western or farm party. Stack 2 pieces of the Red Barn Siding, cut for length and one above the other, to make an 8 foot red barn wall. Then just add finishing touches like the Barn Door and Hay Bale props to complete the look of your barn walls. 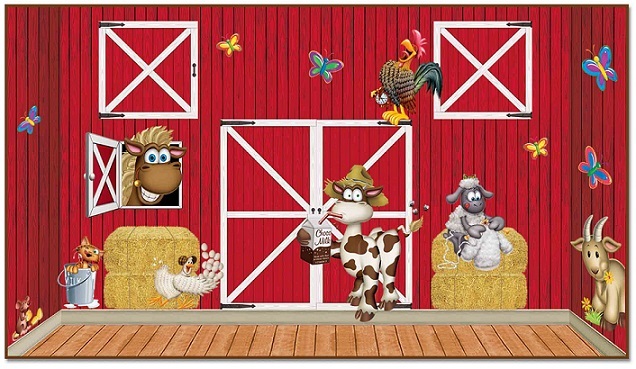 Every barn needs livestock, choose your favorite Barnyard Cutouts to add interest. Add Plastic Wagon Wheels and Molded Plastic Barrels for extra farm flavor.